175 years. A demisemiseptcentennial anniversary! In a country as “young” as the United States—it is only 242-years-old after all—175 continuous years in business is something to commemorate. During 2017, we used every opportunity to reflect on our history, look ahead to our future, and celebrate the moments and the people in the present that make Harford Mutual a very special place. My one-year term as the Chairman of the National Association of Mutual Insurance Companies (NAMIC) Board of Directors came to a close in September. 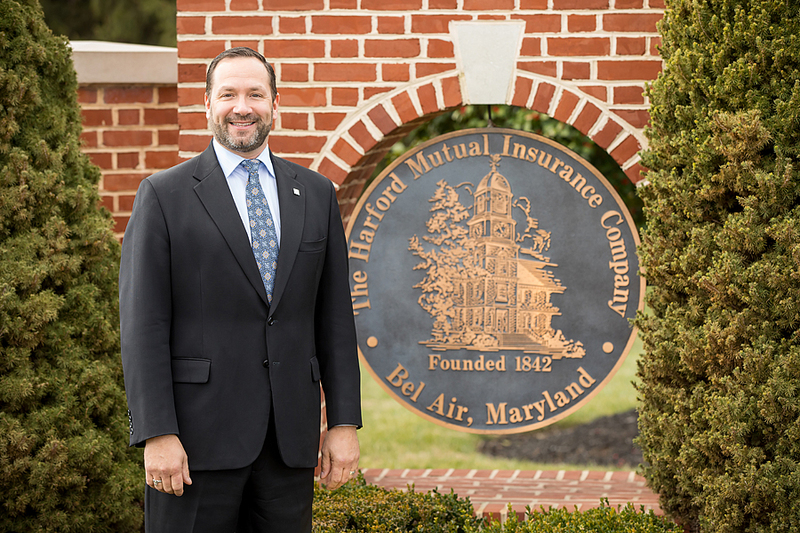 I was honored and humbled to be able to represent Harford Mutual during its 175th anniversary year as I traveled the country attending 14 State Association meetings and sharing NAMIC’s commitment to mutuality. I saw and heard firsthand the benefits that NAMIC brings to its 1,400 members and, by extension, their 170 million policyholders through their leadership in advocacy, focus on continuing education, and dedication to member services. The Chairmanship also provided me the opportunity to share our own evolutionary story and exchange ideas on positive business practices in the rapidly-changing employment and technology realms. Our Marketing team, with the help of several committees, planned and executed a calendar full of events to ensure the 175th Anniversary encompassed not only staff, but our agents and community partners as well, beginning with appreciation dinners in the spring served to our local first responders. The year was capped off with a holiday lighting of our beautiful building and property, followed by a reception for local dignitaries and special guests. As much as the anniversary was an underlying presence, 2017 proved to be groundbreaking on its own merits. Writing $20 million in direct written premium in the month of January was a first for our company and a bellwether for the premium growth in the year to come. Our Vice President & Treasurer, June Poole, and our Vice President & Corporate Secretary, Frank Kellner, were both individually honored not once, but twice, for their professional and philanthropic contributions to our communities. We completed a full and successful year of business unit segmentation and started writing in South Carolina in September 2017 and Georgia in February 2018, expanding our market for the first time in nearly three decades. Harford Mutual was named a 2017 “Top Workplace” by The Baltimore Sun Media Group, a noteworthy achievement as this award is a direct result of our employees’ feedback. We continue to invest significant effort and resources in career and professional development, and this recognition is a testament that employees believe in the company’s mission. We had an exceptional production year, writing over $35.7 million in new business premium. A major driver of our growth was the segmentation of Underwriting by account size into Business Units—Foundation, Middle Market, and Large, all of which outperformed new business goals. With the strong premium retention and significant outperformance to plan in new business, year-end revenue grew by $15.9 million to end at $200.8 million, pushing us through the $200 million mark for the first time in our 175 years of business. Five-year direct written premium growth is an incredible $77.2 million, 62.4%, averaging a 10.2% annual growth rate. The 10-year revenue growth is equally impressive at $95.1 million, 90.0%, and is evidence of our strong agency partnerships, improved diversification, account-size focus and segmentation, expanded loss control and risk management and, of course, our talented and professional staff. The flurry of claim severity during the final quarter of the year, the poor results from the automobile line which equally continues to plague the entire industry, and individual claims with severity potential, stressed our combined. However, our positive loss results in the first and second quarters allowed our year-end combined of 96.7 to come in 2.1 points below plan. Mutual success only comes when our considerable growth is coupled with commensurate profitability. Our 10-year combined ratio stands at 97.3, and we have achieved an underwriting profit in 11 out of the past 13 years. Total assets, which eclipsed half a billion dollars for the first time in our history, have grown by $197.2 million, a 64% increase over 10 years, with 82% of the increase coming in the last five years. Year-end policyholders’ surplus grew by $23.4 million to $232.0 million, 11.2%, maintaining the company’s conservative leverage and bolstering our financial strength. In March 2018, John Goodin, Senior Vice President, Commercial Business Services, retired after nine years with Harford Mutual and more than 40 years in the insurance industry. While John’s departure was bittersweet, we are fortunate to have Susan Dinnien, a 25-year insurance veteran, immediately assume the role of Vice President & Chief Underwriting Officer. Jeff Rink, Vice President, Marketing & Business Development, who joined Harford Mutual in 2009, was promoted to Senior Vice President. Jeff has been an integral member of Senior Leadership over the last nine years, spearheading the charge for the company’s significant and profitable revenue growth. Looking back, 2017 was exceptional on so many levels—a year worthy of its place in Harford Mutual’s continuing story. Looking ahead—new challenges, new faces, and new initiatives keep us working diligently to maintain our strong financial position and our goal to always be an employer of choice. I’d like to thank our board of directors and our incredible team for their individual and collective contributions to our commitment to mutual success.